During big sales events like Prime Day earlier this month, you can sometimes find a good robot vacuum cleaner for around $200. That’s an incredible price for a device you’ll wonder how you ever lived without, but you can save even more money if know what to look for. Lucky for you, we’ve done all the heavy lifting for you and found a fantastic new option that’s shockingly affordable. Check out the ROLLIBOT BL618 Quiet Robotic Vacuum Cleaner, which costs a fraction of what most companies charge. It includes just about every feature you might want, and there are also some extras you won’t find on most robot vacuums, such as a UV sterilization feature. HEPA AIR FILTER- The floor cleaning robot removes allergy causing pet hair, dust particles, pollen, and dander to create a cleaner breathing environment. 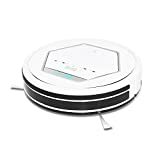 SUPER QUIET INTELLIGENT CLEANING – Using 10 sensors and 4 intelligent cleaning modes, the robot floor cleaner locates all types of messes and avoids objects. WIRELESS REMOTE CONTROL – Configure the Rollibot to schedule cleaning, start, stop, steer, switch cleaning modes. WASHABLE DUSTBIN & BRUSH – for easy cleanup. Simply dump, brush, rinse, and repeat to maintain your automatic vacuum cleaner.